DONATE BEADS TO CHARITY.. Bead donations gratefully accepted. 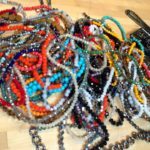 Beading Divas to the Rescue cannot do what we do (raise vast sums of money for animal charities) without hundreds of thousands of donated beads! Whether you have a few strands, a box, a bucket, a barrel or a treasure chest of beads – we want them! Do you know of a bead store going out of business? Let us know! Looking for more venues to drop off beads — Do you have a store in the Northwest/Oro Valley area, Northeast/Foothills/Eastside? 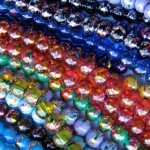 On rare occasions or a really big stash, we will make special arrangements to pick up beads. Where can you find beads? Yard sales, estate sales, Tucson Gem & Mineral Show, bead stores, on vacation, in craft stores, in your drawers, in your jewelry box (we also accept beaded jewelry that can be taken apart), ask your family and friends, bead websites. Link to this bead page. What kinds of beads can be donated? 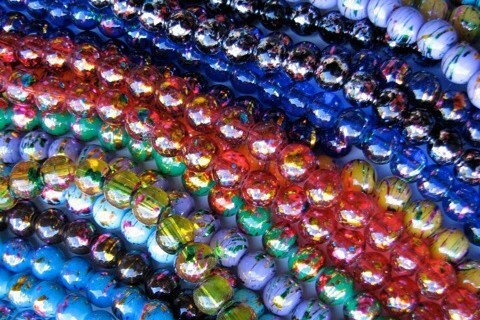 A vast assortment of beads – wooden, metal, metallic, painted, clay, charms, glass, ceramic, turquoise, Lucite, gemstones, pearls, rhinestones, crystals, colorful, clear, neutral, fillers, fiber, mesmerizing, funny, designer, sparkly, artful, vintage, spooky, natural, all colors of the rainbow beads, handcrafted, high quality plastic, funky, stones, larger seeds, hardware, have holes, buttons, etc. Please no Mardi Gras beads (they cannot be restrung). Do you provide a donation receipt? Yes, upon request one will be emailed to you. Thank you and please help us spread the bead gospel. Just bead it!